Winter wildlife watching takes good eyes, patience and warm clothes—and an interpretive wildlife tour with Eco Tour Adventures takes everything to the next level. 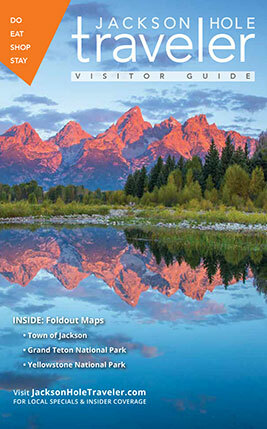 Here, Jackson Hole Traveler editor Julie Butler shares her experience during one of the outfitter’s winter tours. Witnessing the incredible spectacle of four coyotes chasing a lone wolf off an elk carcass on the National Elk Refuge in Jackson Hole isn't typically the way I start my day. Normally I may just spy a robin outside my window while I down my coffee. But on a recent chilly March morning, the sight of several carnivores frolicking was exactly what I experienced at the beginning of a sunrise wildlife tour with Eco Tour Adventures. We who call Jackson Hole home live where the wild things are. During the winter months, however, spotting abundant wildlife can be challenging. Sure, the occasional moose will find its way into my backyard, and elk are, of course, plentiful on the refuge. So, when I was offered the opportunity to see and learn about all manner of the Greater Yellowstone ecosystem wildlife by taking a four-hour sunrise tour through parts of Grand Teton National Park with Eco Tour Adventures, I was thrilled. The tour departure site was the Home Ranch parking lot, located off Town Square. I arrived just as the sun was rising at 7 a.m. The naturalist wildlife guide, Laura Krusheski, greeted me with a warm and friendly smile. She told me a family of four would be joining us on the tour. The visiting family that included two young girls, hailed from Austin, Texas. This was their first time in Jackson Hole. The mom, Deborah, said that they had chosen to vacation here because of the wildlife viewing opportunities; obviously they had come to the right place by booking this tour! Before we departed in the spacious and multi-windowed van, Laura explained how the three large roof hatches worked and handed Miriam, the oldest daughter, a wildlife sightings list on which she could write down what time she spotted wildlife, the species, whether the animal was male or female, its behavior and habitat. Laura also had us familiarize ourselves with our binoculars. The family was really interested in seeing wolves, but Laura explained there would be no guarantees of seeing them up close, hence, the binoculars and the high quality spotting scopes that she would be setting up on our various stops throughout the morning. As we drove by the elk refuge on our way to the National Museum of Wildlife Art’s parking lot atop a hill across from the refuge, Laura explained its history. Once we arrived at the museum’s lot, she strategically set up the two tripod-mounted spotting scopes. Through the scopes not only could we view in more detail the elk and several bison wandering about the refuge, but we could also spy elk by the dozens coming over Miller Butte onto the feeding grounds; a spectacular and curious sight. Before we left, Laura offered us organic, locally baked breakfast muffins and other goodies. I indulged in a yummy blueberry muffin with hot cocoa; bonus perk! We then stopped at the National Fish Hatchery, a fun surprise for me, as I had never been there before. While the family and I were inside the warmth of the hatchery getting a mini-tour of how the famed native cutthroat trout are spawned, Laura was outside setting up a scope near one of the hatchery’s ponds, aimed at the far end of the refuge. After re-joining her, a peek through the scope and our binoculars revealed a group of pronghorn grazing near the elk herd. Then suddenly, we witnessed four coyotes chasing a lone wolf away from an elk carcass. We all oohed and aahed, excited to have seen a wolf, however briefly and at far distance. The elk were seemingly unfazed by the interlopers in their midst. A red-winged blackbird, harrier hawk and bald eagle made appearances, a sure sign that spring was returning to Jackson Hole. Ducks bobbed along in the pond, and we spent roughly an hour there at the hatchery transfixed by the wildlife both winged and pawed. Experienced guide and naturalist, dedicated to giving you a memorable day in the Tetons. High quality binoculars and spotting scopes. Pick-up and drop-off in town at your hotel or a convenient meeting place. A light breakfast and a nice variety of snacks that are locally produced, and organic when possible; hot and cold beverages are also available. A lunch to remember in a park lodge or museum, with views of the Tetons. Comfortable 4x4 vehicle where everyone is guaranteed a window seat. Visual aids and field guides to help with a hands-on learning approach. We headed next towards Kelly, keeping our eyes peeled for moose along the Gros Ventre River. Even though we wouldn’t be seeing bear, Laura nevertheless explained the differences between grizzly, black and brown bears, their physical attributes, diets and hibernation habits. We stopped briefly at Kelly Warm Springs when we turned onto Gros Ventre Road towards the Slide Lake area, watched some ducks and scanned the horizon for four-legged creatures. After a short drive up the road and on our way back to town, we passed a few moose bedded down in the snow-covered sage. Laura informed us that moose were basically the biggest deer in the world. Who knew? Well, now we all did! Throughout the excursion, not only did Laura educate us on the flora and fauna we were seeing, but also the geology of the land we were traveling through. At one point she even pulled out a naturalist kit from the back of the van that contained a few antlers, pelts, claws and horns and explained the properties of each one. I happily soaked in all of this new knowledge. The tour was a successful and meaningful experience for all. If you’ve never spotted a moose, elk, bison, coyote or bald eagle before, I highly recommend you take an interpretive tour with Eco Tour Adventures on one of your first days in Jackson Hole; they’re wild! For more information and to book a tour, call 307-690-9533, or visit jhecotouradventures.com. After 20 years of visiting Jackson Hole from Connecticut, Julie Butler moved to the area permanently three years ago after her youngest child graduated from high school. She has been making her living as a magazine and newspaper editor and writer for a few decades now.